Note The primary data source for this paper is the US Census Bureau's annual Public Education Finances Report. During the course of analyzing this data, and through experience doing similar analyses in previous years, we developed concerns with some of its accuracy. School funding and expenditure numbers reported by the Census sometimes do not match what the Massachusetts Department of Elementary and Secondary Education (DESE) reports. The Census Bureau relies upon multiple data sources to generate their school funding and expenditure numbers, and they make their own estimates in order to facilitate cross-state comparisons when reporting methods vary across states. In aggregating this data from fifty different state systems, errors sometimes arise. For this reason, we believe strongly that a more accurate representation of school funding can be supplied by DESE, and one should consult it first for school funding data questions that are specific to Massachusetts. For cross-state spending comparisons, though, these Census data remain the best available source. Further, release of this report was delayed after we discovered a mismatch between how state pension contributions on behalf of Massachusetts teachers were reported compared to how they were reported by other states. This mismatch has been rectified. 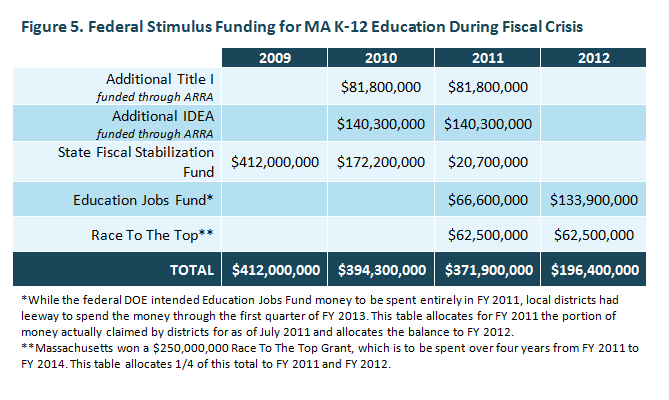 Fiscal Year (FY) 2010 education spending data from the US Census Bureau provides important information on long-term spending trends in Massachusetts and help paint a picture of the state's commitment to elementary and secondary public education. This Census data also allows for instructive comparisons between Massachusetts's support for public education and that of other states. While we are actually in FY 2013, the census has a significant lag time in the release of education spending numbers. Massachusetts is below average in total education spending as a share of the state's resources. Massachusetts ranks high in per-pupil spending. 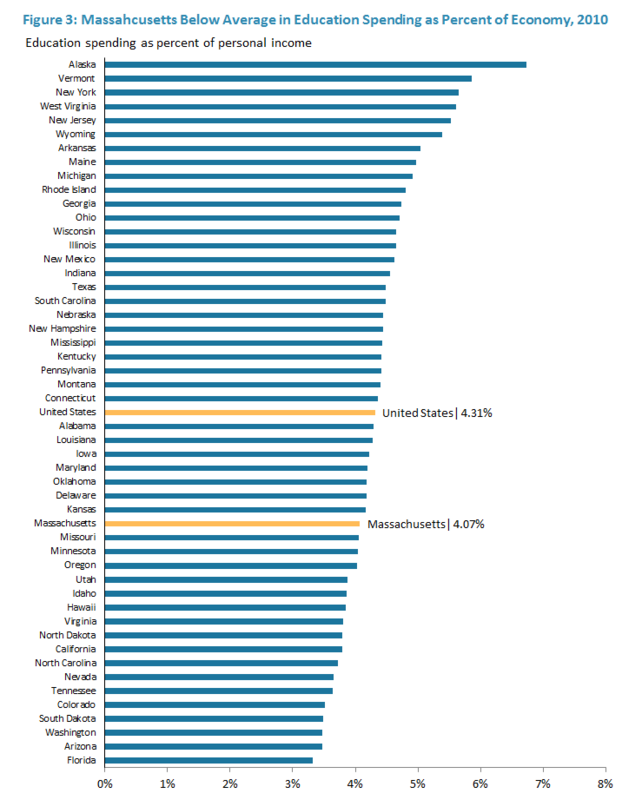 As a high income state, Massachusetts can rank above average in per pupil spending while at the same time contributing a small portion of the state's resources to education. Massachusetts ranks high on educational outcomes as reflected in National Assessment of Educational Progress (NAEP) standardized test scores, often leading the nation. 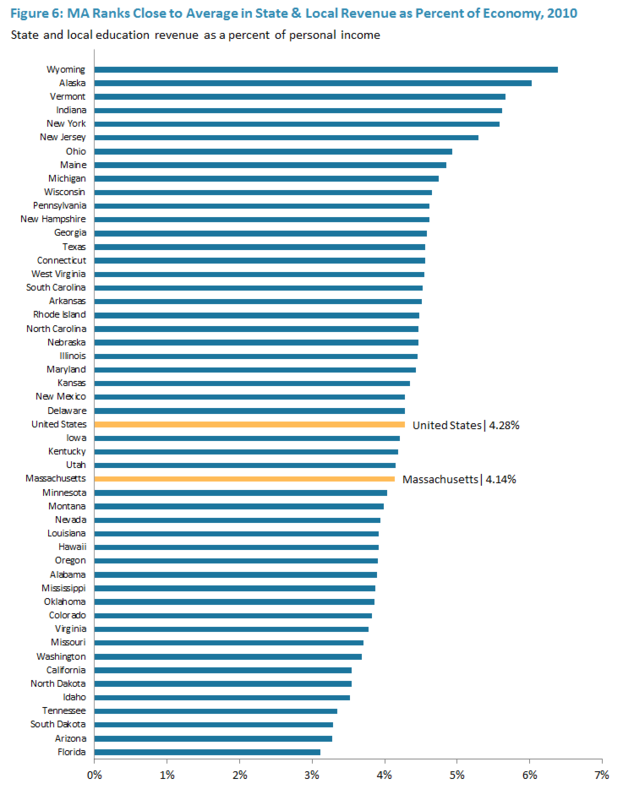 Massachusetts ranks near the bottom (47th) in federal funding as a percentage of all education revenue. Massachusetts schools continue to rely heavily on local funding sources. State and local budget cuts that followed the onset of the Great Recession coincided with a large infusion of federal stimulus funds. The FY 2010 data release represents the second year in which we observe a nationwide trend in the increasing dependence of states on federal education revenue. The federal government responded to the fiscal crisis in states by distributing additional federal education funding through the State Fiscal Stabilization Fund (SFSF), a subset of the larger national stimulus bill, the American Recovery and Reinvestment Act (ARRA). States distributed the education portion of their SFSF allocation to K-12 school districts during FY 2009, FY 2010 and FY 2011. How much does Massachusetts spend per student? What are the sources of funding? We also include an in depth discussion of federal stimulus support and its effect on the state budget. How much does Massachusetts spend per pupil? Massachusetts's results on the National Assessment of Educational Progress (NAEP) suggest that the state is getting strong results for its high per-pupil investment. Figure 2 shows a snapshot of these scores for eighth grade math and reading between 1992 and 2011, a time frame during which the state increased its commitment to helping fund K-12 education. To see how Massachusetts compares to other states for different demographic subgroups at different grade levels and subject areas please click here. What Share of Our Resources do we invest in K-12 Education? While Massachusetts ranks high in per-pupil spending, we actually dedicate a relatively small share of our state's resources to education. As a wealthy state, Massachusetts is able to rank high in per-pupil spending and low in spending as a share of the economy, reflecting the fact that Massachusetts has a greater capacity to fund programs and services. The economic measure of personal income captures how much money is earned by the people of Massachusetts in a given year. It is a good measure of Massachusetts' ability to fund government services.4 Education spending as a percent of the state economy is below the national average4.07 percent vs. 4.31 percent nationallyas shown in Figure 3. It is important to note that the measure of education spending as a percent of the state economy, shown in Figure 3, looks at direct elementary and secondary education spending from all state, local, and federal sources; this measure does not include spending on capital projects or other community programming or adult basic education classes. Public schools in the United States have historically been dependent on local property taxes, particularly in New England. The Massachusetts Education Reform Act of 1993 served to reduce somewhat this reliance in Massachusetts, ushering in a series of significant state funding increases during the remainder of the 1990s. While Massachusetts has shifted some of the education funding responsibility away from local sources, Massachusetts still relies heavily on local revenues when compared to other states. 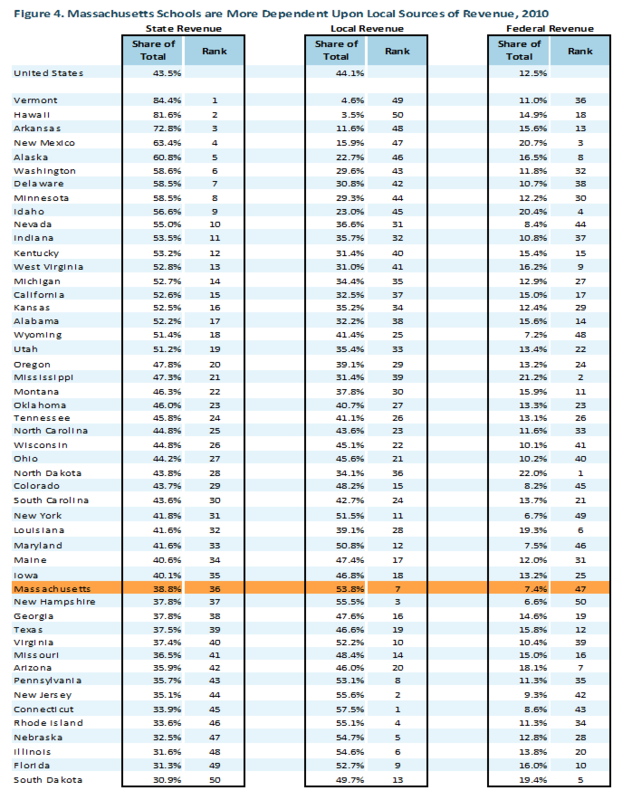 In FY 2010, Massachusetts was seventh most dependent upon local funding (see Figure 4). One reason why Massachusetts ranks low (47th out of 50) in the share of federal dollars dedicated to education is that Massachusetts is a relatively wealthy state and federal education dollars are predominantly targeted to less wealthy schools. A significant portion of federal education revenue, such as Title I funding, is distributed in proportion to the number of low-income students in a school. Massachusetts has a low rate of child poverty and, therefore, receives less of this federal support. The second reason why Massachusetts ranks low in federal education revenue is that it was one of the few states that chose to spend most of its federal stimulus money during FY 2009 (see Figure 5). FY 2009 was the first year in which Census data reflects increased federal education revenue distributed to states and local school districts through the American Recovery and Reinvestment Act (ARRA). For three years starting in FY 2009, ARRA funds increased federal education support in a few different ways, including through the State Fiscal Stabilization Fund (SFSF), increased Title I and Individuals with Disabilities Education Act (IDEA) funding, the Education Jobs Fund, and the Race To The Top competitive grant program. Figure 5 outlines these sources of funding during the four fiscal years affected by the ongoing fiscal crisis. Massachusetts's low rank is expected to continue when the census releases similar spending data for FY 2011, since it only had a balance of $20.7 million left in SFSF funding (Figure 5). It is important to note that federal funds are only a small portion of most states' education revenue. On average the federal government only accounted for 12.5% of all education funding in FY 2010 (Figure 4). Massachusetts relies on both local government and state government support, mostly through local property taxes and state government appropriations to finance public school. Compared to other states, Massachusetts ranks below the national average in the state's share of education spending. 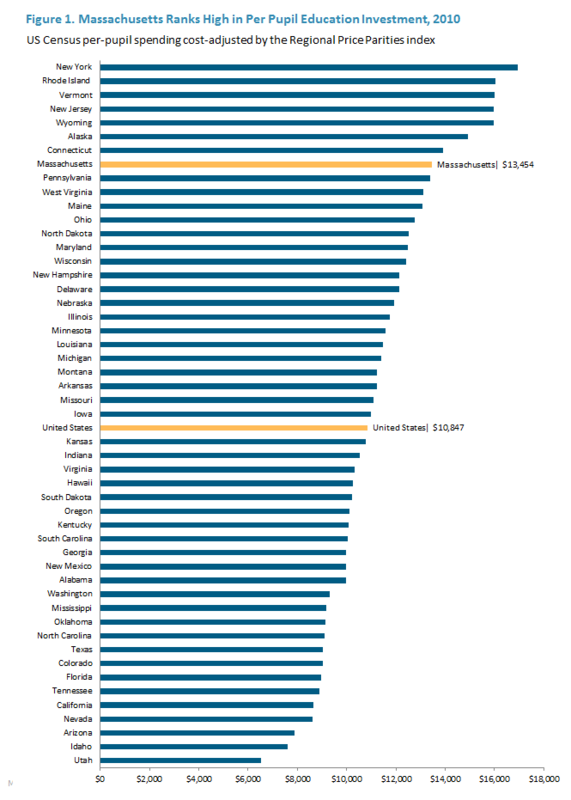 In FY 2010, Massachusetts ranked 36th in state spending as a percentage of the total education investment. However, when adding local revenue, Massachusetts is very close to the national average of state and local education revenue as a share of the economy, setting aside federal money. As Figure 6 demonstrates, state and local education revenue in Massachusetts comprises 4.14 percent of personal income in FY 2010, compared to the national average of 4.28 percent. Massachusetts is not especially rich in natural resources, but what it does have is a highly educated workforce.5 Massachusetts has many world class schools and the best education outcomes of any state.6 However, we cannot rest on our laurels. While we are able to rank high in per pupil spending, Massachusetts dedicates a smaller share of our overall resources to education than the average state. Furthermore, in many of our communities, a significant share of our students do not receive the support they need to meet our state standards.7 Building a strong foundation for economic growth in the years ahead will likely require expanding access to high quality education for all of our young people, and particularly those in lower income communities. 1 For more information on the use of personal income to gauge economic growth please see: New England Public Policy Center of the Federal Reserve Bank of Boston, "Assessing Alternative Measures of State Income," July 30, 2008. 3 It is important to note that the Census's per pupil measure includes only direct educational expenses—including things like employee salaries and benefits, administration, and materials—and does not include capital spending and debt service. Per pupil measures that include capital spending can be useful in capturing the full costs of running school systems, but they can lead to great variation over time and across states. Capital spending fluctuates year-to-year because large payments happen over different years, depending on when large investments are being made, and this can lead to volatile per-pupil spending amounts that do not necessarily affect students and teachers at the classroom level. Additionally, states report capital spending in different ways and the Census Bureau has a difficult time gathering 50-state data that allows for meaningful comparisons. 4 For more information see MassBudget's Adjusting for Personal Income: When, Why, and How. 5 See MassBudget's State of Working Massachusetts-Labor Day 2012. 7For more information on the underfunding of Education Spending see the Massachusetts Budget and Policy Center Report entitled Cutting Class: Underfunding the Foundation Budget's Core Education Program.